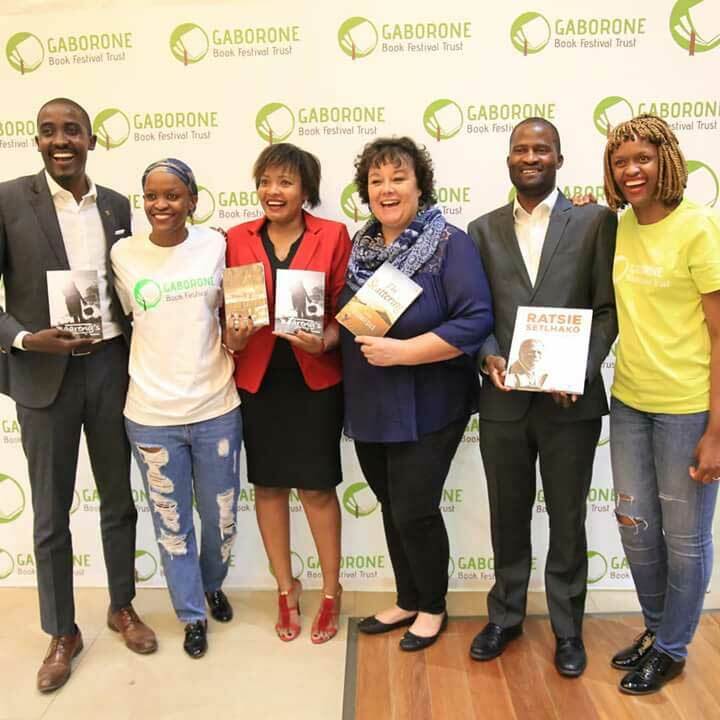 The Gaborone Book Festival Trust hosted a Book Night on World Book Day 2018 to celebrate the transformative power of books on April 23, 2018. The night featured four Batswana authors in moderated conversations followed by book sales and signings. World Book Day is an annual event organized by the United Nations Educational, Scientific and Cultural Organization (UNESCO), to promote reading, publishing and copyright on April 23. The event is celebrated with a series of events all over the continent and around the world. In Botswana, the Gaborone Book Festival Trust hosted a book night to commemorate this special day at the University of Botswana. The featured authors on the evening and their books were Lauri Kubuitsile with The Scattering, Modirwa Kekwaletswe with Ratsie Setlhako, Thabo Katlholo with Blameless, and Kagiso Madibana with Baareng. Here are some highlights from the presentations on the stage. Lauri Kubitsile – The in’s and out’s of writing a historical novel. Lauri opened her conversation by reading an excerpt from The Scattering which is set in 3 countries – Namibia, South Africa and Botswana. It took her four years to write this novel, inspired by the Herero Genocide and the Boer war in Transvaal. She had to read and research a lot about the genocide, including reading academic work. She decided to show the resilience of the human spirit rather than focus on the actual genocide. It was also deliberate for her to make women central to the novel to show that they are strong and how they deal with atrocities, and how the human spirit is indomitable. Kagiso Madibana and Thabo Katlholo – Young, Motswana, Author – The challenges and the triumphs. Kagiso Madibana calls herself a storyteller more than a writer with Baareng, the name of her book also being the name of her grandfather. She used real life experiences to write Baareng and to motivate young people. It is a set book in 2 private primary schools in Botswana. Thabo Katlholo on the other hand said writing Blameless, the writing process specifically, was easy. It was however taxing emotionally as he had to write about his life including the mental health issues he grappled with. He is very passionate about mental health issues, history and indigenous languages. He also said there is need to promote local literary work which will include promoting our heritage and culture. Modirwa Kekwaletswe – The delicacy of writing about a Motswana musical giant. Modirwa gave a talk about his journey on writing about Ratsie Setlhako, a Botswana folkore music legend who has inspired a generation of Botswana folklore musicians and poets. Ratsie was an artist that made a life from singing and playing the segaba. It took him 18 years to complete the project as information about the artist was not readily available. His greatest motivation was to contribute to the literary space and have a book about Ratsie despite the challenges he faced. Though recorded by Radio Botswana in the late 1960s, Ratsie’s music continues to be played to this day. All photos in this blog are courtesy of Press Photo Agency. Here are more images from the day. Thabo Katlholo, Keikantse Phele (co founder) Kagiso Madibana, Lauri Kubuitsile, Modirwa Kekwaletswe and Kenanao Phele(co founder). In September, the Trust will host the inaugural Gaborone Book Festival from the 21-22.